Plant taxonomy classifies Chocolate Drop stonecrop as Sedum 'Chocolate Drop'. 'Chocolate Drop' is the cultivar name. Although technically, "stonecrop" is used in the plant's common name, the botanical genus name Sedum effectively doubles as an alternate common name, being highly recognizable among even just moderately earnest gardeners. Sedum 'Chocolate Drop' is a herbaceous perennial. It is also considered a succulent. Succulents can store water in their foliage and stems, which is why they tend to resist drought so effectively. The water content in their leaves and stems helps account for their feeling "fleshy." The word, "succulent" is also used, of course, in the world of cuisine, where it means "juicy." The overlap between this usage and the way the term is used in the plant world should be apparent: both refer to moisture content. This succulent with the sweet-sounding name puts out flowerheads of pink flowers for me in zone 5 in July. But growing Chocolate Drop sedum is not really about the blossoms. It derives its colorful cultivar name from its best feature, which is its leaves. The plant grows in a clump, which comprises multiple stems of a reddish-purple color. As the clump expands, the number of such items will increase. Leaves of a dull purple color (some green is mixed in, too, if you look up-close) encircle the stems. From a distance, what you basically see is a dark plant: that's the operative word here. Chocolate Drop sedum grows to about one foot in height; at maturity, its spread may be twice that. Species of the Sedum genus are indigenous to various regions of the Northern Hemisphere. This particular cultivar is listed as being growable in planting zones 4-8. 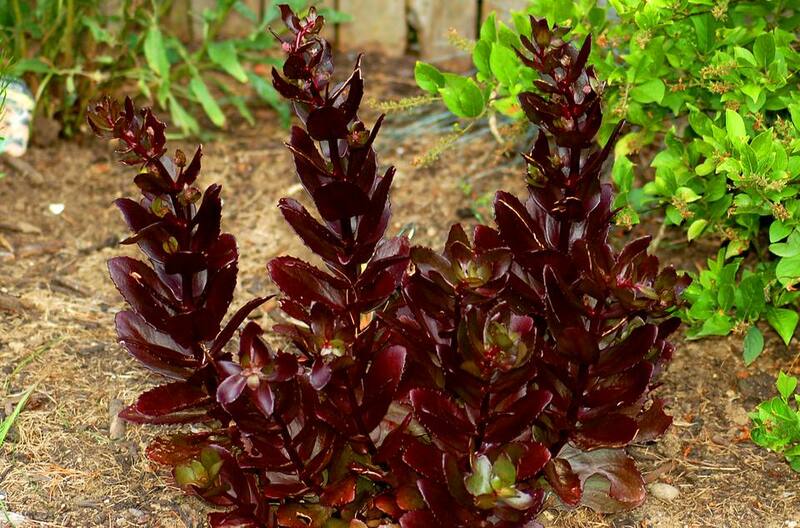 Grow this dark-colored succulent in full sun to partial shade. The plants grow best in a sandy loam soil that is well-drained and poor-to-average infertility. Those of you familiar with succulents will not be surprised to learn that this plant is a "poster child" for rock gardens. It also makes a fine edging plant; with its dark color, it would set off a stone walkway comprised of light-colored stones very nicely. These heat-resistant perennials give you an attractive option for those sun-pounded spots in the yard where only full-sun plants will work. Chocolate Drop sedum is among the plants that attract butterflies. Fortunately this is a deer resistant perennial and also is not popular among rabbits. On an aesthetic level, what is most noteworthy is that Sedum 'Chocolate Drop' is one of the so-called "black plants." On a practical level, it is one of the drought-tolerant perennials. That makes it low-maintenance and a fine selection for xeriscaping. But in addition, there's a nice contrast between the two stonecrops in terms of texture, Angelina's leaves exhibiting a fine texture by comparison. This succulent also looks good next to blue flowers.